Did U Miss on Coach Eric Musselman? Sunday was an interesting day for Golden Gophers basketball fans who scrutinize the program. Minnesota athletic director Mark Coyle squelched speculation he might move on from head coach Richard Pitino, and instead awarded him a contract extension. Arkansas athletic director Hunter Yurachek hired Eric Musselman as the Razorbacks basketball coach and ended any conjecture Musselman could be headed to Minneapolis as Pitino’s replacement. This writer was told by a former college coach that Musselman expressed interest in the Minnesota job last year. There has also been a recent rumor Musselman reached out to Coyle indicating he was more interested in coming to Minnesota than leaving his job as Nevada head coach to take over at Arkansas. Musselman was born in Ohio but moved to Minnesota when he was in grade school. That happened when his father Bill Musselman became head coach of the Gophers prior to the 1971-72 season. Bill was just 30 years old when he took over a Minnesota program locked in mediocrity and fan apathy. Musselman, though, created a renaissance of interest and passion for Gophers basketball seldom seen before or since at Williams Arena. The packed building rocked with music and cheering 30 minutes before game time. Fans clapped and roared their approval to the pregame Harlem Globetrotters style warm-up routine Musselman created for his players. When the games started, screaming fans were ready to blow the roof off the arena, cheering for some of the best talent the Gophers have ever had. Overnight Musselman turned Minnesota into a national power and won the 1972 Big Ten championship. Eventually Musselman ran afoul of the NCAA and left Minnesota to coach in the pros, but his impact in Dinkytown and across the state was undeniable after creating so much more interest in not only the Gophers but the sport of basketball on any level. As a youngster Eric witnessed his father’s success, obsession to win, and driving himself to exhaustion. His dad’s imprint led him down a basketball trail as a player and then a coach including in Minneapolis. Bill was the first head coach of the 1989 NBA expansion Minnesota Timberwolves, and Eric became an assistant for his dad after beeing the youngest head coach at age 23 in Continental Basketball Association history. Eric was later head coach of the NBA’s Sacramento Kings and Golden State Warriors. As a basketball junkie and vagabond he’s travelled to a lot of places as both an assistant and head coach in the pros and college, but you can see why Minnesota could feel like home, and why that speculation of being interested in the Gophers job might well be true. Minnesota has become a talent-rich area for high school basketball players and potential college recruits. A Gophers coach who could keep a high percentage of the best players home each year would be well positioned to compete for Big Ten championships a lot of the time. During the last four years Musselman has demonstrated he can recruit and win at a much more difficult place to win (Nevada) than Minnesota. Five years ago Musselman was trying to jump-start his career while serving as an assistant coach in college basketball at LSU. In March of 2015 he then took over at Nevada where the program had been struggling. In four seasons with the Wolf Pack Musselman’s teams compiled records of 24-14, 28-7, 29-8 and 29-5, per Wikipedia. His teams won three consecutive Mountain West Conference titles, set a home attendance record, and advanced to three consecutive NCAA Tournaments including a Sweet 16 appearance a year ago. Going into last season the Wolf Pack drew mention as a top 10 team nationally. Now 54 years old, Musselman may have made his last coaching stop in taking the Arkansas job. He lands in Fayetteville, instead of Minneapolis, in a less attractive place and in a less desirable job. If he had been hired by Minnesota he would have brought an impressive coaching resume including a know-how to win, and possibly a pregame warm-up show to put life back into an arena that often is lifeless and filled with thousands of empty seats. He could have rekindled memories for older fans and made new fans out of people of all ages. 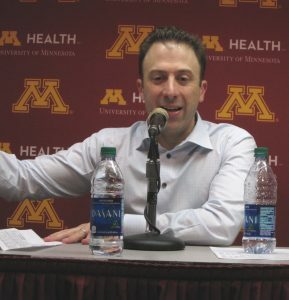 Those empty seats (the Gophers sold out one home game in 2018-19) may well have played a role in Coyle sticking with Pitino, his six-year Minnesota head coach. The Gophers are dealing with budget issues and mandated cuts in the Athletic Department. Asking Pitino to leave would have cost the department millions of dollars. Coyle, hired as athletic director in 2016, has shown patience with and been supportive of the basketball program. 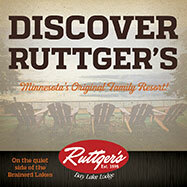 Pitino’s regular season Big Ten record is 40 wins, 70 losses. Only once (2017) have his teams won more than half of their conference games. Two years ago Minnesota, coming off a 2-16 conference season in 2016, went 11-7 in league games and Pitino was named 2017 Big Ten Coach of Year. 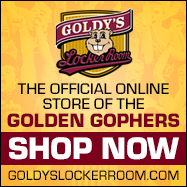 This past season the Gophers were 9-11 in Big Ten games. They rallied late winning five of their last eight games including victories in the Big Ten Tournament and NCAA Tournament. Wins over Purdue (twice) and Louisville were particularly impressive but critics believe the program is stuck in mediocrity. Pitino went into last season on a short list of college coaches on the “hot seat,” per national media. The Gophers, though, exceeded the expectations of some media and fans, including by earning their way into the NCAA Tournament for just the second time in the Pitino era. The roster for next season is in flux. The team’s best player, junior forward Amir Coffey, is testing the NBA’s interest in him and he might forego his last season of college eligibility. Guard Isaiah Washington, the former state of New York Mr. Basketball, left the program earlier this spring. Two starters, forward Jordan Murphy and guard Dupree McBrayer, and two key reserves, guard Brock Stoll and center Matz Stockman, won’t return because all four are seniors. With multiple scholarships for next season available but only two commits so far, the coaching staff is in pursuit of players to provide immediate help. Ironically, Musselman might have been hired by the Gophers in 2013 instead of Pitino. Then athletic director Norwood Teague had been turned down by multiple coaches when he decided to offer the job to the 30-year-old Pitino whose only head coaching experience was one year at a place on the fringes of Division 1 college basketball—Florida International. More than one source will tell you that next on Teague’s candidate list might have been Musselman who at that time was an assistant at Arizona State. If so, the Musselman to Minnesota possibility struck out in 2013, and again on Sunday. Two strikes and you’re out. Ball game over.